Some of you may know one of my favorite colors is navy blue! I have always liked blue and navy is such a classic I can not deny my love for it! In interior design we see trends come and go, but using navy in a design is always a timeless choice. A great place to try a dark color is in the bathroom, contrary to popular belief it actually can make the space seem larger. This small bathroom has a clean look due to the contrast of the light and dark, the navy walls and claw foot tub are stunning! This kitchen has a beautiful white color palette with the exception of the navy lower cabinets. The designer made them the focal point and added other details such as the marble counter top, the double sinks and the white subway tile. This kitchen also has a clean but more rustic look and the focus is on the bold navy subway tile. The mix of woods and metals keep the space interesting. The first thing I noticed in this space is the great verticality of the windows and built ins. The windows illuminate the painted blue wood that functions as serving and display space. A built in is always a good choice and this washed navy really adds to the room! In addition to loving navy I also love velvet, so these navy velvet chairs are right up my alley! It is very interesting that the two chairs are in fact different, they both look very comfortable and I could definitely grab one of those books and curl up! Here we have more blue velvet, with a very different application. This versatile dining space is adjacent to a living space, these ottomans would be perfect to more around while entertaining in both areas. The only thing that could be more exciting than navy velvet is navy leather! 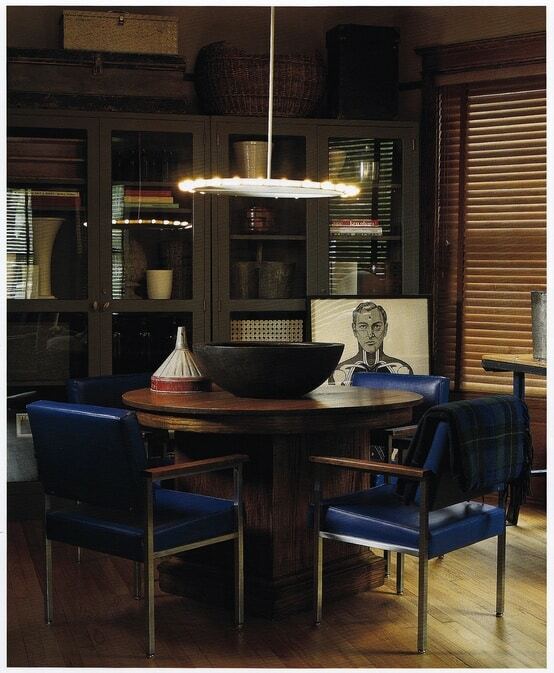 Here is a wonderfully masculine dining room with metal framed chairs upholstered in gorgeous blue leather! I hope I have inspired the navy-lover in you all. Please feel free to upholster anything in navy, Nandina Home & Design’s Custom Workroom would be happy to help. Whether furniture, paint or tile, Navy is a timeless color that can blend into any style!